This medium roasted tea has a strong dark chocolate aroma but sweet floral aftertaste and flavor that never goes bitter. Compared to other medium roasted tea, which have a heavy concentrated taste, Shui Jin Gui gives you a clean slippery feeling that allows you to appreciate the character of this bush. This charcoal roasted tea has a strong dark chocolate aroma but sweet floral aftertaste with a flavor that never goes bitter. Compared to other medium roasted wulong teas, which have a heavy concentrated taste, Shui Jin Gui gives you a clean slippery feeling that allows you to appreciate the character of this bush. It is one of the four famous wulongs from Wu Yi Shan. A story tells of exceptional tea bushes cultivated by monks living high on the slopes of Wuyi Shan. A torrential storm washed a few of these cliff-dwelling bushes down onto another farmer’s land. The bushes carried water and clay down the slopes with the tea bush on top, resembling an algae covered longevity turtle swimming in the water, thus the name “Water Turtle” was given to these bushes. The monks wanted the bushes back but the farmer refused. The local court decided in favor of the farmer claiming natural forces had favored him. Although there are still three original bushes remaining, no tea is picked from them because of the age of the bushes. All Shui Jin Gui was cultivated from these original bushes. The leaves from this tea bush are long and arrow shaped, thinner than other wulong varietals. Shui Jin Gui is one of four famous rock wulong tea bushes, still using traditional methods of processing. The picking time for this tea begins in early May. The picking standard is “zhong kai mian” which means picking when the last tea leaf opens from the bud and is two thirds the size of the most mature leaves of the new growth. The fresh leaves are carried back to the factory in large bamboo baskets and left to wither in the sunshine for about 2-3 hours. This tea is not made by machine, so the tea master will set the leaves on bamboo trays to naturally oxidize. Every half hour or so, he must shake the tea trays by hand, letting the leaves twist on each other, gently breaking the cells of the surface and edges of the leaves. During this naturally oxidation process, the fresh tea’s aroma will fill up the factory. The tea master will have almost no time to sleep except when the tea pickers are gathering leaves, they must nap instead. They have to carefully stop the oxidation at just the right time, paying close attention to when it is time to stop the oxidation process. Jiu Qu Creek surrounding rock wulong garden only allows bamboo rafts on the water, no motorized boats. Natural oxidation (without machine) takes about 8-10 hours. Machine oxidation takes about 5-6 hours and requires little manual labor. Traditional way to make rock wulong tea is by roasting the tea over charcoal in these bamboo drum-shaped trays for about 8 hours a few times over the course of 4 months. 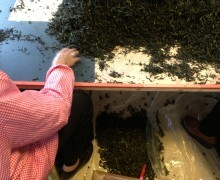 Sorting through rock wulong leaves to pick out stems and older, yellow leaves. Great rock wulong tea master (man in the white short sleeved t-shirt) was a teacher for many famous rock wulong tea masters in Wuyi Mountain. Infusion: First infusion at least 1 minute. The leaves are good for 6 infusions.